If you have a large yard or need extra run time, the RYOBI 40-Volt 5.0 Ah high capacity battery is the perfect addition to your RYOBI 40-Volt collection. This 5.0 Ah battery lasts 2X longer than the standard RYOBI 40-Volt high capacity battery while delivering the same fade-free power and performance. All RYOBI 40-Volt batteries come with an on-board battery life indicator for user convenience and over-molded edges for impact protection. This battery works with all RYOBI 40-Volt tools and chargers. All backed by a 3-year warranty, there's never been a better time to consider cordless. Lithium ion batteries offer longer runtime and more charge cycles than conventional NiCad batteries. This 18V Lithium-Ion Battery Platform from Makita features an Optimum Charging System and built-in memory chip for efficient charging. RIDGID introduces the 18V OCTANE Bluetooth 3.0 Ah Battery. The OCTANE Bluetooth 3.0 Ah Battery features extreme runtime and best-in-class intelligence. This battery offers 2X more runtime when compared to standard 1.5 Ah lithium-ion. With Bluetooth technology, the jobsite is opened up to many features that will increase productivity throughout the work day. While providing increased performance with all RIDGID 18V tools, OCTANE batteries provide maximum performance when paired with OCTANE tools (not included) for high demand applications. This battery is backed by a 3-Year Limited Warranty. Chargers are sold separately. Ryobi 18V ONE+ introduces lithium-ion performance at NiCad prices. This upgrade kit is powered by new and improved lithium-ion batteries. They provide four times more recharges, hold a charge four times longer, offer 20% more runtime and are 45% lighter weight than NiCad batteries. Batteries stored on the IntelliPort charger are conditioned for peak performance. Upgrade your ONE+ tool collection to lithium-ion performance. 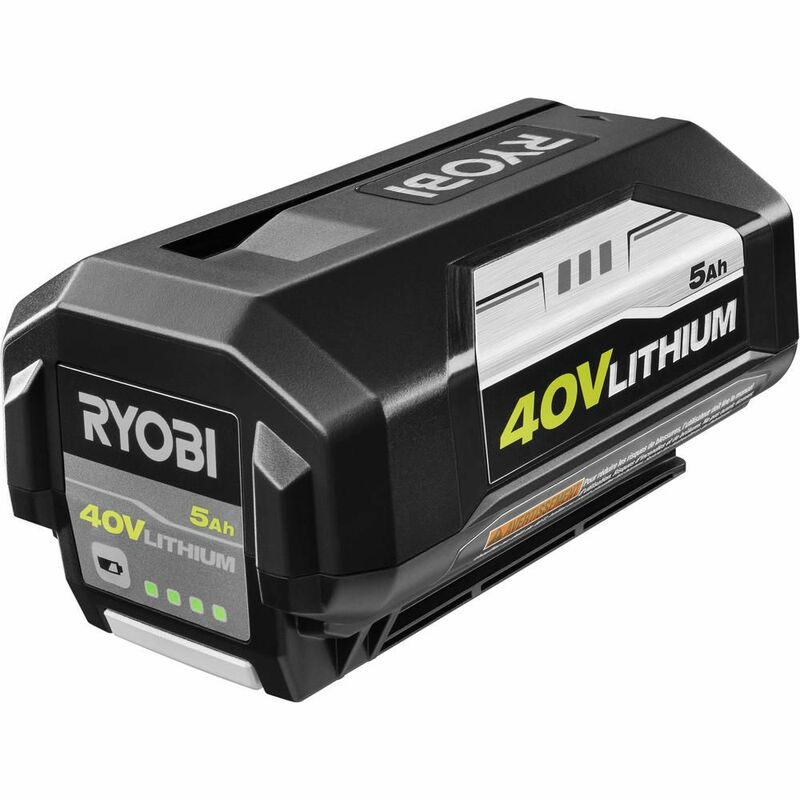 40V Lithium-Ion 5 Ah High Capacity Battery If you have a large yard or need extra run time, the RYOBI 40-Volt 5.0 Ah high capacity battery is the perfect addition to your RYOBI 40-Volt collection. This 5.0 Ah battery lasts 2X longer than the standard RYOBI 40-Volt high capacity battery while delivering the same fade-free power and performance. All RYOBI 40-Volt batteries come with an on-board battery life indicator for user convenience and over-molded edges for impact protection. This battery works with all RYOBI 40-Volt tools and chargers. All backed by a 3-year warranty, there's never been a better time to consider cordless. 40V Lithium-Ion 5 Ah High Capacity Battery is rated 4.4 out of 5 by 887. Rated 1 out of 5 by Molinabee from 7 minutes - less than original mower battery These batteries are a joke. I have 2 batteries, one came with mower, one spare. Both are supposed to be half as powerful. Owned them 3, maybe 4 years. They only last maybe 10 minutes each. Wanted more time out of it. Bought 2 of these. First died after 7 minutes. Thought maybe defective. 2nd died after 10 minutes. Waste of money and my time. HUGE disappointment. Am returning them today. Rated 1 out of 5 by YAMAMOTO from Been a big fan of Ryobi products. They've been my go to brand for power tools I will only use onc... Been a big fan of Ryobi products. They've been my go to brand for power tools I will only use once or twice. They wind up being the longest lasting over all the big brand names. With that, I went all in on the 40 volt cordless products. (cordless blower greatest invention since the wheel) Blower, edger, tree trim chain saw, even the mulcher. Although I like the tools, their Achilles heel are the batteries and chargers. They both constantly go bad. At 1st Ryobi would promptly replace but now not as EZ. I HIGHLY RECOMMEND LOOKING AT OTHER BRAND NAME SYSTEMS. Rated 5 out of 5 by OutsideGmom49 from So far have used the battery with the 14" Ryobi... So far have used the battery with the 14" Ryobi Chainsaw and it is fantastic, the charge lasting well beyond trimming oc front and back yard. Will be using it with the Ryobi lawnmower and can't wait to see how it performs. So far, so good. Rated 5 out of 5 by Stanley from The battery has plenty of power. It lasts much longer... The battery has plenty of power. It lasts much longer than the original battery does.Used mainly on my Ryobi blower. Rated 5 out of 5 by Diana from One of the two batteries I purchased works well. I... One of the two batteries I purchased works well. I give it an excellent However, the other one will not hold a charge - it keeps blinking even on the charger. Pressing the spot to say how much is charged shows -0-. I need to return it soon.